Booster Gold wants his flight ring repaired. He reckons he isn't quite the same without it, less worthy. And Brainiac is only too happy to mock him for it - for having stolen the ring to begin with and for being less than heroic without it. On New Krypton, Superman - the "Liberator" - is getting a history lesson from Chancellor Pa-Vel, where he learns that these Argo-Kryptonians do not worship Rao the way that the Kryptonians that appeared on Earth had. They worship a god that Superman himself once knew. Meanwhile, a discussion between Saturn Girl and Brainiac on peacekeeping status leads to the suggestion that they might eventually need to activate Legion Protocol Six, recalling Legionnaires from all corners of space and time - the same Protocol that brought Booster and Clark to the 31st Century. 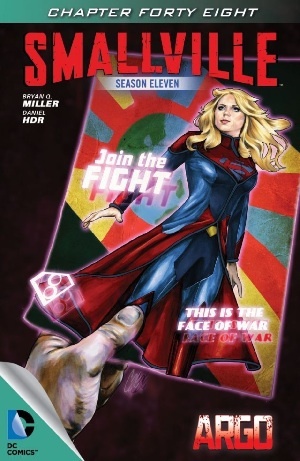 Cosmic Boy reveals to Supergirl that he and Saturn Girl have become amorous, but Rokk is more interested in what Supergirl has to say about her time infiltrating EarthGov. Just then, Superman appears and says he knows what's going on. New Krypton is searching for a burial site. So because this is a middle act, set-up-the-main-conflict kind of chapter, I'm going to be gracious, give the thing a correspondingly middle-of-the-road 3 (.5 if I could), and agree for the time being to wait a bit and see. Art - 3: Equally middle-of-the-road, with no particular lows or highs. All around competent work to be sure, but not especially memorable, either.